Most adaptable in cultivation, the Tonga pelargonium, is a free flowering garden and container plant. Plants are deciduous, perennial, low growing shrubby herbs, which grow up to 200mm (or 400 mm if the flowers included) in height with a spread of 400mm. Plants die back in winter. The pale green stems are slightly succulent as are the simple lobate palmate leaves which resemble those of the popular Pelargonium peltatum. Pelargonium tongaense flowers freely over an extended period from spring to autumn (September - April). Plants are blessed with bright scarlet red flowers borne in heads of 3-8 flowers on 200mm stalks. 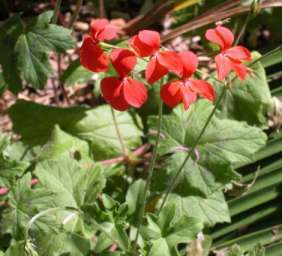 The flowers are quite similar to those of Pelargonium inquinans which is often cultivated in gardens. Pelargonium tongaense plants are endemic (naturally restricted) to KwaZulu-Natal (KZN), and are recorded from a small area in the northeastern KZN. They can be found growing in forests, under bushy trees, on loose reddish sandy soil, near the Pongolo River from Tete Pan north to Tembe. 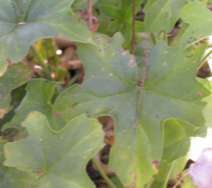 These plants occur in temperate to cool growing areas, with an annual rainfall of between of 600 mm to 800 mm during summer months (November-December). The name Pelargonium come from Pelargos (Greek word): meaning, stork; Stork's Bill which refers to the rostrum (beak-like extension) of the schizocarp (dry splitting fruit into two or more parts) which resembles the bill of a stork. Tongaense refers to the Tongaland area, KZN where this species was discovered. Material of P. tongaense was originally collected in 1955 by Mr. Jobe Mafuleka (a farm-worker), and he brought the plants to Mr Ian Garland who cultivated them. Reports indicate that in October 1973, the existence of these plants was known to botanists J.J.A. Van der Walt & P.J. Vorster and they expressed some doubts as to whether the plants were indigenous or not. The climatic conditions where these plants grow naturally in Tongaland were found to be somehow uncommon for the genus Pelargonium, and was then thought these plants were perhaps hybrids from P. peltatum & P. inquinans. It was only in November 1981, when Libelepi, young son of Mr Mafuleka took the above-mentioned experts to the natural locality where P. tongaense grows, that the two were then convinced that this was a separate species and it was formally described. Plants attract certain insects including butterflies. Plants are vigorous and extremely showy garden subjects, which can be grown either as container plants or as groundcovers under trees. Since these plants grow well and flower in shaded areas contrary to other common winter rainfall pelargoniums, they are recommended for mixed borders in subtropical gardens. Plants prefer light to dense shade (but can be grown in full sun as well), and grow optimally in loose, well-drained, sandy soil. The plants die back in winter and should not receive much water then or they may rot. Prune dead flowers as soon as possible in order to maintain the attractiveness of these plants, since their bright green, lobed leaves are equally attractive. P. tongaense plants are easily propagated from cuttings or seeds, and experience has shown that if seeds are sown whilst fresh the results are much better. JOFFE, P. 2001. Creative gardening with indigenous plants: A South African Guide. Pretoria: Briza Publications. POOLEY, E. 1998. A field guide to wild flowers KwaZulu -Natal and the eastern region. Durban: Natal Flora Publication Trust. SCOT-SHAW, R. 1999. Rare and Threatened Plants of Kwazulu-Natal and the neighbouring Regions: Pietermaritzburg. KwaZulu-Natal Nature Conservation Services.